Add some sharp looking style to your ensemble with our Silver Sequin Bow Tie. Each 7" x 4 1/2" bow tie comes with elastic to easily just about anyone. 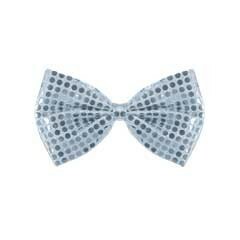 Our Silver Sequin Bow Ties are priced per tie. Please order in increments of 1 bowtie.